The suspension is viewed as a huge success by Instituto Gaia, a long-time partner of Both ENDS in Brazil, who has been trying to halt the destructive construction of hydro dams in the Pantanal for many years. Through their persistent and tireless lobby, advocacy and awareness-raising activities the members of the organisation -mostly volunteers- have, without doubt, contributed to this fantastic outcome. The Pantanal is the world's second largest freshwater wetland with an extremely rich biodiversity. Tourism and fishing are the main sources of income for the local population. This enormous ecosystem is invaluable for the water management of a big part of the continent, stretching all the way down to the Argentinian La Plata area, some 1.500km away. One of the biggest threats to the Pantanal is the planned construction of over 150 small dams in the rivers that are part of the wetland. These dams are used to produce energy and thus are a lucrative investment. However, most of this energy is not even meant for the local population, but goes straight to the big cities in the rest of the country or is even sold abroad. The construction of these dams has an enormously detrimental impact on the entire fragile wetland and the social fabric of the area. By stopping the free flow of the rivers, the dams destroy invaluable river ecosystems for example by hindering the movement and breeding of fish and other species. Furthermore, the necessary construction work of the dams and their embankments lead to massive loss of unique biodiversity and affect thousands of river adjacent communities who depends on a healthy river landscape for their income. The regional governments are required to hold public hearings before the licensing of new dams is granted. But given that these processes are often not carried out correctly, the local groups who oppose the construction of new dams have over the past years managed to successfully disrupt and halt a number of these hearings by mobilising the local people likely to be affected by their construction. According to the local groups, the licensing processes and the hearings are not only often following faulty procedures but until now also frequently rely on inadequate social- and environmental impact assessments. But according to the local authority in the Pantanal area, the new studies by the ANA could improve their procedures and project licensing criteria. This could mean that in the future, hydro projects in order to be given the green light, they would have to meet stricter social and environmental criteria. This would be a hugely important step in securing the future of the health of the entire Pantanal area. Both ENDS started actively supporting local organisations striving to protect the Pantanal – such as Instituto Gaia - in 1994. This has culminated in a large, long-term programme in four countries (Brazil, Bolivia, Paraguay and Argentina) which supports local organisations in their efforts to protect the entire Rio de la Plata Basin of which the Pantanal is part. This unique programme is called 'Wetlands without Borders' and is funded by DOB Ecology. The Indonesia Water Community of Practice (IndoWater CoP) was declared on December 3, 2014 by a group of Indonesian NGOs whose members felt very concerned about the poor management of Indonesia's water resources due to a lack of integrated planning on river basin management, community participation and law enforcement. 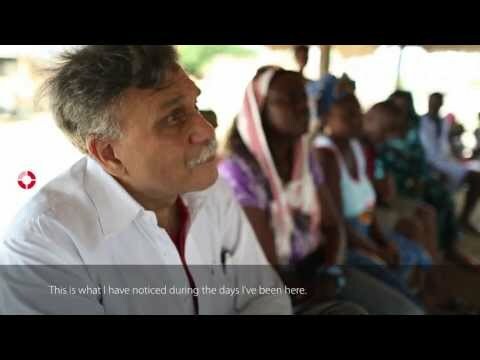 In this short movie we follow Indian professor Vijay Paranjpye, who has dedicated his life and work to finding ways of involving local communities in the management of natural resources such as water. What is the Negotiated Approach and what has been achieved so far? This film takes us to India and to Benin to show both results and possibilities.